This is without a doubt one of the dumbest and worst films ever made. I came of age during the 80s and even I can’t sit through it. Terrible performances, breathtakingly silly dialogue, and gawdawful music. Is to film what Wang Chung was to music. A real super-duper-pooper. OK in all seriousnessity…this movie has a misnomer. It really should just be called “The Lunch/Snack Time Club” because did anyone but me catch the fact that all the significant events occurred..DURING LUNCH/SNACK TIME?? helllo! it wouldn’t even qualify for the brunch club! Sometime between 1967 and 1970 pictures started to stink more and more. But for about 15 more years at least they had solid storyline. Then in 1985 with the premiere of the Brat-Pack pictures (beginning with this one)pictures sucked and no longer had solid storyline. As for this film. I rest my case. The story which is (only!!!) about teenagers in detention wouldn’t have made a z-picture in Hollywood back in the 1950’s. As for the dialogue well, it’s weird to say the least. The film is pretty pointless! This movie is terrible! I’m clueless why it’s so popular. I’ve never seen so much concentrated whining a movie. Please don’t waste your time by seeing this one. When did dysfunction become something you celebrate with evening family screenings on the courthouse lawn with funny hats, foam-filled chairs, sacs of nutritionless substances and an out-of-place Husker Du reference? Or is it? I like to split up into three sections and go zooming across the screen, feet up like hooks, tail grinding in the gravy. How does a director even convince human beings to act in such a manner? Hi, have you heard, I’m the nerd. Then they show it at the retro soc hop iGasm. And you take your disillusioned significant other, palms pasty, hands clasped awkwardly and tight, reaching toward one last empty grasp at what is now long past, becoming a biased memory. 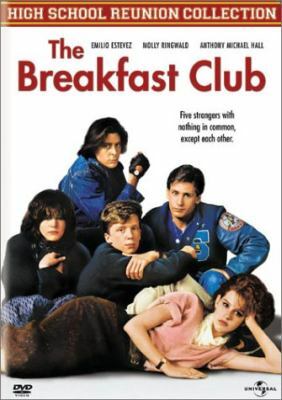 You know what a breakfast club is? It’s where you compare the size of your sausages and — ladies in da hizzo — your eggs. John Hughes can script and direct very well and proved that with”Pretty in Pink: and “16 Candles”. Legend has it that he cranked out the screenplay to “Breakfast Club” in two days, and I think it really shows. With exception of Anthony Michael Hall, the players are all poorly cast. Molly Ringwald is pretty and talented, but not pretty or talented enough to make an impression as a spoiled teen queen. Nor are Nelson and Estevez buyable as class stoner and class jock. Kids this age are often shallow, but the roles here have all the real depth of a leaky baby pool. Worse than the poor casting is Hughes’ “reach-to-be-deep” script. This group of kids are supposed to jointly reach profound conclusions about their lives and themsleves in the matter of a few hours of detention. It’s a try-too-hard grasp at brilliance that cheapens the viewer and writer both. With the small cast and lack of location shots, I’m amazed that I’ve never read about some high school drama club doing a stage production of this disaster. In any case, I’ve got a Breakfast Club DVD I’ll never watch again – I’ll post it under “Used & New” above. I came for the ” seriousnessity”, but I stayed to learn about the “LUNCH/SNACK TIME?? helllo! it wouldn’t even qualify for the brunch” club. Often I don’t read these posts simply because I can’t handle that large a dose of stupidity (particularly if I’ve been forced to see even a single second of Fox News recently), but this really cheered me up. Thank you, LUNCH/SNACK TIME poster. You really made me think. Of brunch. You just can’t depend on cinema anymore. Or, as a brilliant philosopher/anonymous dumbass above once said, it really puts your, “feet up like hooks, tail grinding in the gravy”. I weep for all the sportos, motorheads, geeks, sluts, bloods, wastoids, dweebies, and dickheads. some people have no appreciation for campiness. My ex-wife did a rendition of TBC when we were in highschool. She played clair. Haha, that’s funny if you knew her. Emelio Estevez was not in this movie. The only movie he ever made was Repo Man. All other appearances were done by a doppelganger. A clone. Maybe Nexus 1?